Challenges with endpoint management, dependence on graphics-intensive workstations, increasing remote workforces, security, and more all highlight the need for digital workspaces. 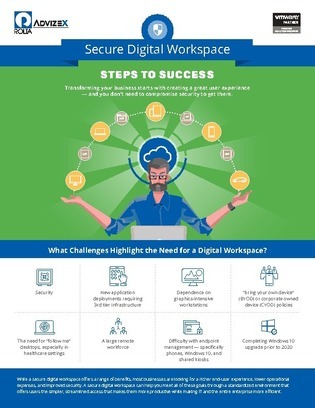 Digital workspaces provide a standardized environment that offers users simpler, streamlined access that makes them more productive, while easing management and security concerns for IT. Download this guide for the 8 steps to creating a secure digital workspace for your enterprise.